A group of Emergency Social Service professionals will be hosting a workshop during the EPBC conference being held at the end of October. This workshop will focus on collaborating with ESSD’s around the Province to engage in topics of interest in order to move subjects forward. We are looking for students to take notes during the conference, assist with set up & take down and to help facilitate table discussions. All volunteers will receive a free entrance pass to this workshop. Interested students are asked to contact Tara Stroup, Emergency Program Officer, City of Port Coquitlam at stroupt@portcoquitlam.ca or 604-927-5460. 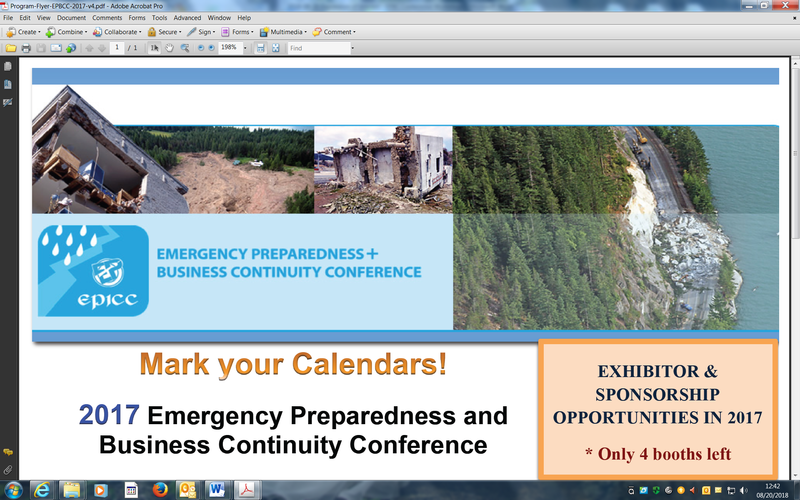 The Emergency Preparedness and Business Continuity Conference is a program that brings together topics of importance to the emergency management and the business communities. Two organizations joined together in 2013 to co-host the Annual Conference. The Pacific Northwest Preparedness Society (host of the annual EPConference) and the Emergency Preparedness for Industry and Commerce Council (host of the annual EPICC Forum) have combined efforts to bring a new and exciting forum to the Pacific Northwest region. This roundtable discussion will be hosted to encourage discussion directly amongst Emergency Social (Support) Services volunteers and/or staff from across the province. It will include topics based on a survey shared with ESS team’s province wide to identify topics for discussion related to the teams and the work they do. It is meant to be as inclusive as possible; to share ideas and best practices; to realize the broad spectrum of where we work; rural, remote, urban, etc. and the challenges and rewards that come from these intense times of assisting others in need. The survey will be sent out in early summer to allow ample time for feedback and identifying the topics for discussion. We will share the results of the survey and the notes taken at the workshop with all ESS teams province wide, in late 2018. Under the Emergency Program Act, municipalities, First Nations communities and regional districts are responsible for responding to emergencies in their areas, including providing emergency social services. Each year about 5,000 British Columbians volunteer as emergency social service workers. Interested volunteers will be contacted with more details prior to the conference.